After acquiring B&Q in 1980, Woolworth's Board was keen to harnesss the skills of its founding Director, David Quayle. He was given free rein and a big budget to transform the huge outlet in Broadmead, Bristol into a 'store of the future'. His blue sky thinking ditched the established layout, adopting a range and style that was radically different from a traditional Woolies. Such a transformation needed time to attract new shoppers, but events intervened. New owners took one look at the poor sales figures and took the nuclear option, sacrificing both Quayle and the Broadmead building. Looking back the concept was truly visionary. By 2000 many of the off-the-wall concepts had entered the mainstream, just as Quayle had predicted. Woolworth store managers were surprised by the candour of the new man. He told the 'Management Quarterly' magazine that he would not be constrained by the long heritage and love of variety stores. "What's a variety store? A place that sells lots of different categories of merchandise, I suppose. The variety store is something at which Woolworth has arrived. I am not at a point of arrival, I am at a point of departure. My starting point was to establish what I thought the consumer wanted, and to make him an offer. It is true that 21st Century will provide a number of different categories of merchandise, but my offer to the consumer is not 'come here for variety'. My offer is much more definite, and cohesive, than that." Fellow Board Members feared the paln was too radical, but concluded that Broadmead was only one of a thousand stores. They gave the go-ahead. The building had been constructed in the 1950s. It had replaced a branch in Castle Street which had been destroyed during World War II and had become one of the largest multi-floor outlets. The area was one of the largest and most modern shopping centres in the West of England. It attracted shoppers from a wide area. Quayle aimed to target its 80,000 commuters, who he felt were ill-served by traditional variety stores. 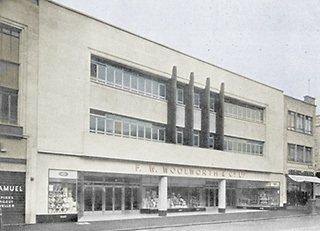 When asked about Woolworth's existing superstores, he replied "I think some of them work and some of them are a muddle, but that is really none of my business." The new layout centred around Leisure. 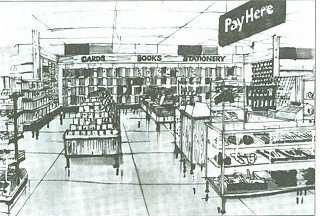 It offered sports goods and clothing near the entrance, drawn mainly from the Woolco range and from the American parent's fashion and footwear subsidiaries. This led into a stylish, upmarket range of fashions. Other highlights included a large music range, with a broad spectrum of LPs and Tapes from classical to heavy metal, and upmarket Hi-Fi and TV equipment. A new 'Shopping Village' comprised a small supermarket, stocking basic groceries, toiletries and household goods. The Upper Floor was home to a Food Court with six distinct menus, including a Burgers, a Baked Potato Bar and a Fish and Chip shop. Quayle believed that city workers expected speedy and courteous service. He hoped that the new range would boost sales and would offer higher margins than the traditional format. He increased staff numbers and paid more to attract higher calibre staff, particularly for selling and customer service. 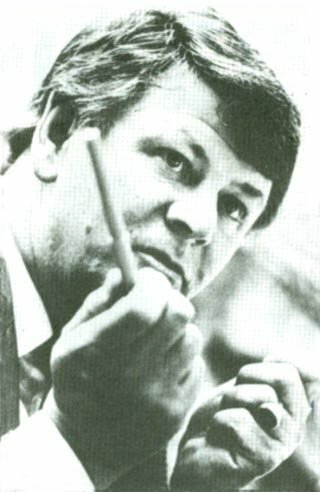 He aspired to offer advice and personal service to every shopper, replacing shop assistants with sales advisers, and paid a premium to fill as many of the posts as possible with university graduates. Early sales at the store were poor. 21st Century Shopping did not succeed in its primary goal of attracting the more affluent city workers who had abandonned the Woolworth store in the Seventies. Loyal shoppers were disappointed to find that 'their store' no longer carried some of the traditional ranges. Before Quayle had the chance to address the shortcomings by publicising the venture, events intervened. A consortium of investors took control through a management buy-in, separating the British chain from its American parent and Footlocker. The new owners had very different ideas about how the red-front chain should develop and had based their calculations on the closure and sale of many of the largest branches. The failing Bristol store became one of their first sacrifices. It was summarily sold to a developer. Cruelly a restructuring saw David Quayle lose not only the Bristol experiment, but control of B&Q, which he had built from scratch. Quayle's ideas for Woolworth were never given the chance to gel. Many were ahead of their time. He was right that by the twenty-first century there would again be convenience grocery shopping facilities in town centres, and that Food Courts, Entertainment megastores and upscale displays of leisure products would become part of everyday shopping life. But each of today's market leaders is a specialist in its chosen market rather than trying to squeeze them all under the same roof as the B&Q Founder envisaged.